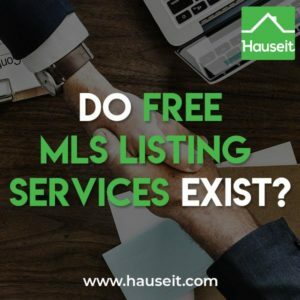 Do Free MLS Listing Services Exist? 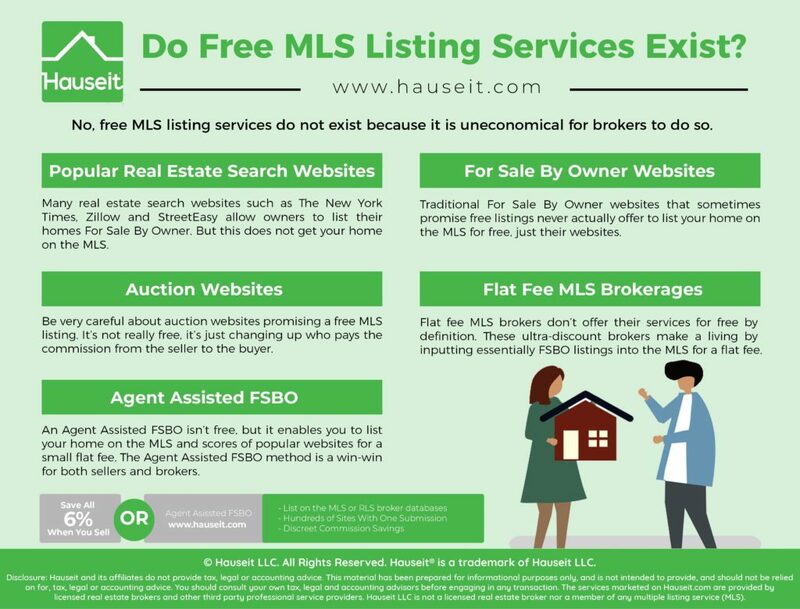 No, free MLS listing services do not exist because it is uneconomical for brokers to do so. Even flat fee listings are barely economical given the potential reputational harm and the possibility of fines from the local MLS for late listing status updates because of the seller. 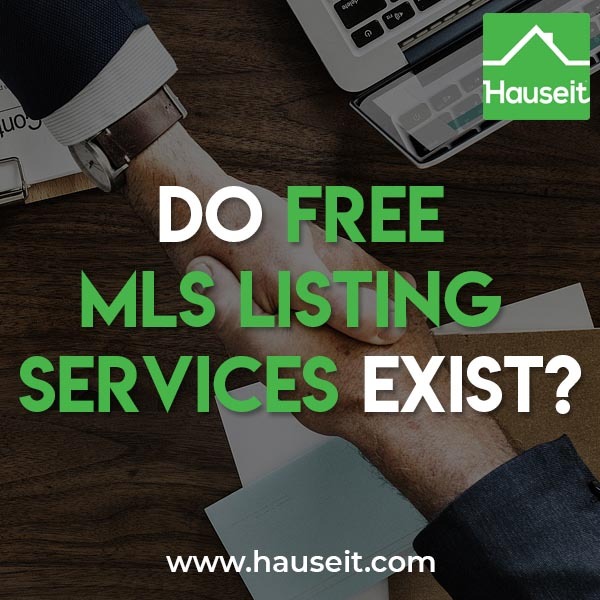 Why Are Free MLS Listing Services Unfeasible? Many real estate search websites such as The New York Times, Zillow and StreetEasy allow owners to list their homes For Sale By Owner (FSBO); however, listing your home FSBO on one of these sites will not get your home listed in the MLS. Furthermore, listing your home FSBO isn’t free. As of this writing, it costs $130 to list your home For Sale By Owner for 14 days on The New York Times. StreetEasy is even more expensive, coming in at $599 for 4 weeks of the basic package. So before you shell out hundreds of dollars, consider that one of the 3 reasons why NYC FSBO sellers fail is due to improper listing syndication. Not being in your local MLS (REBNY RLS in NYC) broker database means you’ll miss out on the 90% of buyers who are represented by agents. Furthermore, you won’t be able to differentiate between real inquiries and the literally thousands of fake inquiries from agents looking to pitch you in person. Pro Tip: What are the best home sale sites in NYC? Read our annual rankings of the best real estate sites geared towards NYC if you’re seriously considering a direct, For Sale By Owner route. Traditional For Sale By Owner websites that sometimes promise free listings never actually offer you a free MLS listing. The free trial or free listing these sites are referring to is simply being listed on their website. Since buyers don’t actually use these FSBO websites to search for homes, it’s a complete waste of time and money. It’s such a scam that some of these sites have language stating that their website is a great source of off-market properties. They’re essentially admitting that by just listing on their website, the property isn’t even on the market because of the total lack of exposure, yet they’re trying to sign home sellers up for their services! Many of these supposed FSBO sites will charge hefty additional fees in order to also get your home on the MLS. Be very careful however about signing up for a flat fee MLS listing with any of these providers as they generally provide zero detail on which MLS exactly your home will be listed in. For example, try getting a straight answer from any of these guys on which MLS your property will be listed in if you live in the NYC area. They probably won’t even understand that the REBNY RLS isn’t a MLS! Pro Tip: Can I sell an apartment in NYC without a broker? The answer is yes, but read our article to learn why it doesn’t make sense to avoid a listing broker altogether. Be very careful about auction websites promising a free MLS listing. What these auction companies are doing is charging the buyer a traditional 5% to 6% broker fee instead of the seller. So it’s not really free, it’s just changing up who pays it. If you read the fine print for some of these auction websites, you may see something like “2% to seller’s broker, 2% to buyer’s broker, 1% to auction company.” That’s far from free! In fact, if there’s a full commission involved, why on earth would you bother with auctioning your house in the first place? Auctions are traditionally for desperate sellers or foreclosures, and can result in fire sale prices if not enough interest materializes. If a full broker commission is being paid, why not enlist the services of a traditional listing agent and have a proper marketing effort? It simply doesn’t make sense to fall for this kind of scam. Pro Tip: You should only be considering an auction if you desperately need to sell fast. If you’re considering a short sale or if you’re already in the foreclosure process, read our guide on a coop foreclosure explained to learn more. By definition, a flat fee MLS broker does not offer a free MLS listing. These ultra-discount brokers make a living by inputting essentially FSBO listings into the MLS for a flat fee. Often times, the only way these brokers are able to make a living is by working from home in a low cost rural location. Keep in mind that it’s very obvious to other brokers what these flat fee brokers are up to, and as a result their listings over time are treated like FSBO listings. These flat fee brokers are unfortunately subjected to ostracism and ridicule from the wider real estate community. Pro Tip: Read our article on why agents won’t do a flat fee MLS listing in NYC to learn why these ultra-discount brokers are so rare. An Agent Assisted FSBO isn’t free, but it enables you to list your home on the MLS and scores of popular websites for a small flat fee. 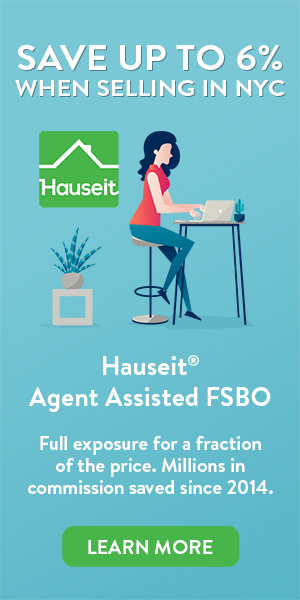 The Agent Assisted FSBO method pioneered by Hauseit pairs sellers with a traditional, local partner broker who never openly discounts their services. Because Hauseit’s partner brokers aren’t discount brokers, you’ll never have to worry about other brokers treating them any differently or your deal being disrupted. The Agent Assisted FSBO method is a win-win for both sellers and brokers. Sellers can access reduced commission services and brokers can provide such services without fear of compromising their reputations or their ability to charge normal commission rates elsewhere. Pro Tip: Debating who to work with? Read our guide on how to find a Realtor to sell my house to learn the most important qualifications to look out for. For example, just how important is perceived local knowledge? Free MLS listing services are unfeasible because they do not make economic sense for brokers. Let’s say that you make $349 on a flat fee listing, paid upfront. That already seems tight for a reasonable amount of work of uploading the listing and making any listing updates and forwarding inquiries over the course of several months. However, that flat fee becomes less and less attractive when you factor in automatic fines levied by the MLS for infractions such as changing a listing status late. Many MLS systems like the Hudson Valley’s Hudson Gateway MLS are extremely strict in this regard. The HGMLS will issue automatic fines starting from $50 if you don’t change a listing’s status within 24 hours, or if you don’t upload a listing agreement within 24 hours of it being signed. Remember that sellers are essentially doing the sale process by themselves, so sellers can be notorious about failing to notify their flat fee broker in time about a status change. For example, we’ve seen cases of sellers just refusing to respond for months, or never at all about whether their in-contract listing ever closed. This presents tremendous problems for flat fee brokers. Do they lie about the contract date if they receive the information late if at all? What about closing out a listing late because the seller didn’t bother to give a timely update? Will the HGMLS find out through public records later and issue a fine anyway if they find out that the closing date was incorrect? All of this hassle makes charging a flat fee barely worthwhile, if at all. Needless to say, there’s no reason any broker would agree to do this for free and compromise not just their reputation (if they are discounting directly) but their balance sheet. Pro Tip: Many flat fee listing agreements will put the onus of any MLS fines on the seller if they are at fault in not passing along status updates in a timely manner. However, who wants to demand their customers to pay fines? It’s certainly not a great business model. What Level of Service Should I Expect from a Flat Fee MLS Listing?